The Technology category Blue Dart was looking to reduce its carbon footprint while enhancing its customer experience, and partnered with FarEye. It was able to reduce costs by using the right algorithms and optimising the work schedules and routes for each delivery personnel. 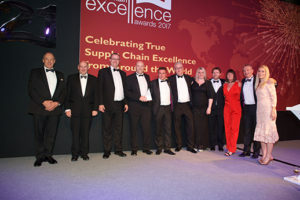 Peter Harvey, chief executive of the Forklift Truck Association, Anthony Munro-Martin, Director, TranSend, Keith Dockrell, Project Manager, P&H, Mark Wilson, Distribution Director, P&H, Derek Elphick, CIO, P&H, Mark Bunting, Project steam lead, P&H, Michele Lockey, Project team member, P&H, Niels Wieberdink, Project stream lead, P&H, Janet Benson, Project stream lead, P&H, John Dineley, Account Manager, TranSend, and host Sara Pascoe. Vodafone’s Procurement Company created a new SaaS tool called the “Procurement Strategist” to redefine the approach, the platform and the tools used in creating and planning category strategies – and dramatically reducing the time taken to develop each category strategy. Judges were impressed by Vodafone’s approach. But ultimately the victory in the category went to wholesaler Palmer and Harvey for its project involving a strategic review of its delivery process and technology used. It has achieved company-wide benefits with some specific departmental benefits identified in the project detail. By implementing a single delivery app and back office system the company has transformed the precision of its fulfilment service. The app and back office system consolidate a multi-party distribution operation where deliveries and collections, with individual special requirements, for eight different parties can be handled on each route.